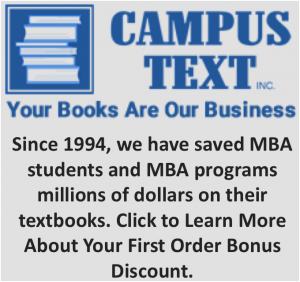 Campus Text provides textbooks to Business School programs throughout the United States and abroad. We have been working with Executive, Professional and Traditional MBA programs for more than 20 years and have developed a reputation for being the “Business School Textbook Experts”. Over the years we have sold books to more than 75 colleges and universities, including more than 100 programs and thousands of students. Through May 2017, we have saved schools and students more than $7,000,000 on textbooks, trade books and classroom materials. If books are included in your students’ tuition, we can ship books to your program for you to distribute to your students or we can ship them directly to your students. If your students are responsible for purchasing their books on their own, we can create a password-protected page on our website, a private e-commerce store just for your program and students. We provide free ground freight on all shipments to your program and we also provide free ground shipping on all student-generated orders over $99. Our customer service is unparalleled. We understand the business school book market better than any other provider. Why trust anyone else? Call us toll free at 888-606-8398 for more information.